2018 New Arrival! ANTV Amplified Indoor AM/FM Antenna. Model No. ANTV3001FM, designed in glossy black finish and compact size is aesthetically pleasing and suitable to match a wide range of home decor styles. Combined with the new digital technology, a low-noise amplifier is built-in to improve the FM signal reception and increase sound quality. The simple design with easy set-up enables you to install the antenna within seconds and position the antenna anywhere in your home. - ★Note★: For assistance with solution for other AM/FM connector types such as IEC female connector,screw-type,3-Pin,2-Pin,Please call us at 1-909-947-8883 or send email for us. - Test the antenna in multiple locations before mounting to determine the best reception location. - Any surrounding obstacles will cause signal reflecting and weakening. Please place the antenna in a clear path between transmitter and reception location. - Install the antenna in a location that is as high as possible for better reception. - Keep the antenna away from any high-power consumption devices to avoid interference. ❖Built-in Amplifier: High-performance with built-in-low-noise FM amplifier for improved radio reception quality. ❖Channels Free: Just use the FM antenna plug in and listen to your favorites music, news, sports and talk radio stations. ❖Attractive Looking: Radio antenna design & engineered in the USA, attractive looking with glossy black design aesthetically blends in with any home interior styles. ❖What You Get: The package in the box included amplified antenna, AC/DC power adapter, table bracket, Instruction/User Manual. 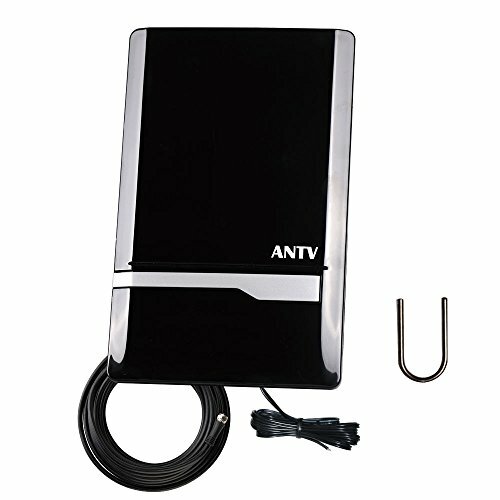 ❖Buyer Guarantee: ANTV stand behind our stereo antenna 100% with a 12-month warranty. If you have any questions about this product by ANTV, contact us by completing and submitting the form below. If you are looking for a specif part number, please include it with your message.